Could wasp venom save your life? Venom that saves your life? It sounds like an oxymoron – or a sci-fi movie twist. But it could actually be a cold, hard fact. Scientists are investigating the strange connection between the social wasp Polybia paulista and cancer cells. They want to know what this connection could mean for future cancer treatment strategies. 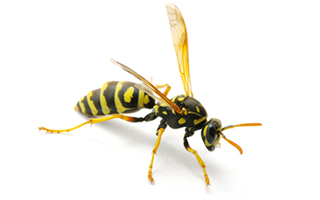 Social wasps aren't as friendly as they sound. They produce a venom with a very particular toxin, called MP1. This toxin kills cancer cells. But, amazingly, it doesn't seem to harm normal cells. And until recently, scientists had no idea how it knew the difference. Researchers Paul Beales of the University of Leeds in the UK and João Ruggiero Neto of São Paulo State University in Brazil decided to find out. They knew that MP1 interacts with lipids of the cancer cells' surface. It creates huge holes in the cell, causing essential molecules to leak out. As you can imagine, this typically kills the cell. But it doesn't do this to normal cells. Neto and Beales thought that the reason might have to do with the structure of cell members. Normal cells contain phospholipids called phosphatidylserine (PS) and phosphatidylethanolamine (PE). PS and PE are typically embedded in the inner cell membrane, so they face the inside of the cells. But in cancer cells, PS and PE are in the outer membrane, facing the cells' exterior environment. To test their theory, Neto and Beales built models of the membranes and exposed them to MP1. They found that the presence of PS made MP1 seven to eight times more likely to bind to the membrane. But even more surprising were the effects of PE. It made MP1 able to create holes in the membrane 20 to 30 times larger when it was present. Neto explains why the size is important "Formed in only seconds, these large pores are big enough to allow critical molecules, such as RNA and proteins to easily escape cells. The dramatic enhancement of the permeabilization induced by the peptide in the presence of PE and the dimensions of the pores in these membranes was surprising." The researchers are going to continue trying to learn more about how MP1 works to see if it has potential for cancer treatment. They definitely think they're on to something. But they need to prove definitively that this toxin is safe for non-cancerous cells. If they can, Beales says, "Cancer therapies that attack the lipid composition of the cell membrane would be an entirely new class of anticancer drugs. This could be useful in developing new combination therapies, where multiple drugs are used simultaneously to treat a cancer by attacking different parts of the cancer cells at the same time." But don't worry — if this does turn out to be a great way to fight cancer, they'll find a better way to deliver it than having a wasp sting you!